95% organic ingredients. Soaked in skin-plumping botanical serum to drench your face in ultra hydration and nutrition for instantly glowing, clear skin. For all skin types. Formulated with 95% organic ingredients, including Rice & Black Soybean, which are naturally fermented to preserve maximum efficacy. This one of a kind mask relies on a blend of fermented seeds and rice to help re-hydrate and calm dry, depleted skin. It works hard and fast to improve skin’s elasticity and firmness. This gel-type mask reacts to skin temperature in order to deliver the benefits of the natural ingredients most directly to your skin. Rice, Soy and Oat Ferments – helps to visible reduce wrinkles and improve skin’s elasticity whilst brightening and improving complexion. Hazelnut Oil – naturally hydrating whilst helpping to unclog pores. Rosewood & Lavender Oil – these essential oils are antibacterial. The sheet part of mask is biodegradable and will either dissolve in water immediately or degrade within one week. 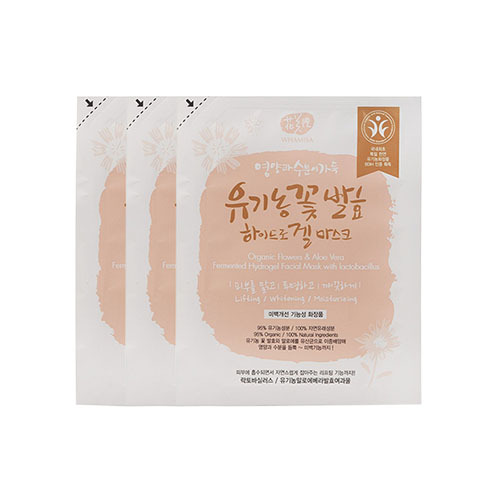 Whamisa’s Organic Flowers & Aloe Vera Fermented Hydrogel Facial Mask is formulated with 95% organic ingredients, including Camellia, Chrysanthemum, Dandelion extract, which are naturally fermented to preserve maximum efficacy. This one of a kind sheet mask relies on a blend of organic flowers and Aloe Vera to help rehydrate and calm dull, depleted skin. 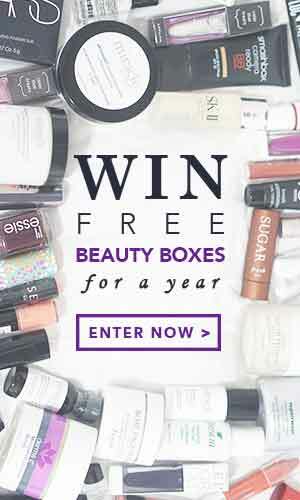 It works hard and fast to brighten your skin tone and improve skin’s elasticity. Aloe Vera, Rice, Yuzu, Green Tea, Peony Root, Licorice Root – botanical extracts to nourish, tone and regenerate skin. Camellia Seed oil – contains vitamins A, B & E and softens and moisturises the skin’s surface, restoring the pH balance and protecting the skin. Fermented Aloe Vera, Molasses, Lotus Flower & Dandelion – these probiotics protect against unfriendly bacteria, pollution and free radicals. Rosewood & Bergamot Oil – these essential oils are antibacterial and remove dirt & pollution from the skin. The sheet part of mask is biodegradable and will either dissolve in water immediately or degrade within one week. Formulated with 95% organic ingredients, including Tomato, Apple, Licorice and Banana, which are naturally fermented to preserve maximum efficacy. 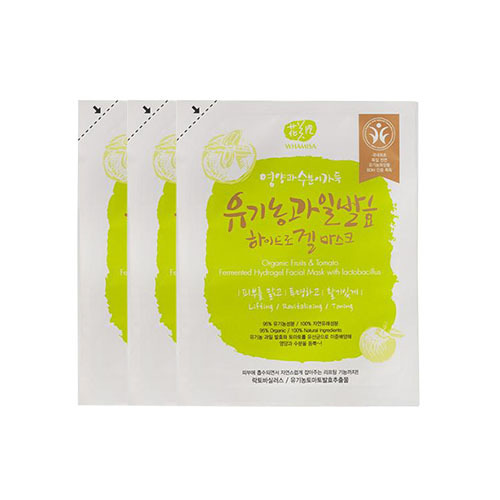 This one of a kind Whamisa sheet mask relies on a blend of fermented fruits and tomato to help rehydrate and calm dry, depleted skin. Apple, Kiwi, Banana and Tomatoes – for clear and radiant complexion. Hazel seed Oil – balances sebum and tightens pores. The sheet part of mask is biodegradable and will either dissolve in water immediately or degrade within one week. After cleansing, unfold the mask. Apply the liquid serum in the mask packaging. Then lay the gel sheet mask over your face and press lightly with your fingertips to set it in place. Leave it on for 20 minutes, then peel off. Gently pat any remaining residue into the skin.